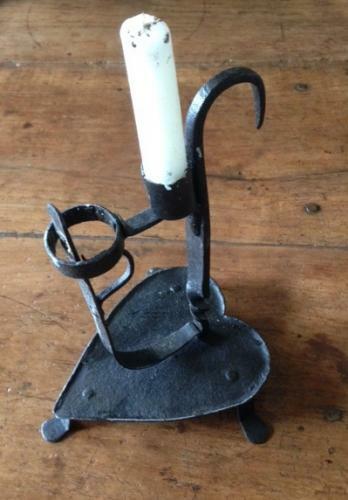 Very nice early 19th cent Peerman/candle holder with heart-shaped base standing on 3 scrolled feet and a carrying hook to the back. This would have been an early portable piece of lighting that could be carried from room to room. The Peerman (a Furze branch) could be placed in the sprung holder and would have burnt with a very white flame. Candles which were more expensive would go in the upright candle holder. The heart-shaped pan would have caught any drips.